It’s a beautiful day out. I don’t want to talk about how Chickenhead was also killed night before last, or how The Engineir very thoughtfully tried to protect me from seeing her ravaged body by burying her before I woke up, or how I had to see it for myself to see if there were any other clues so we dug her back up again only to find no additional insights. I don’t want to talk about the process of finding a retirement home for my mother, aged 61, whose mental capacity continues to decline since we cannot get her proper treatment. No. All of that is too sad for this pretty, pretty day. Let us talk of happier things, shall we? Another artist on the tour lives directly behind us, and told Mike yesterday he frequently has mink in his water garden (a likely culprit for the chicken murderers.) Those folks are really nice people, whom I met a year ago exactly when Bell ran off for about an hour. It’s only been a short time since I brought the crack vanilla beans into the house, and already the downstairs is infused with their olfactory charms. 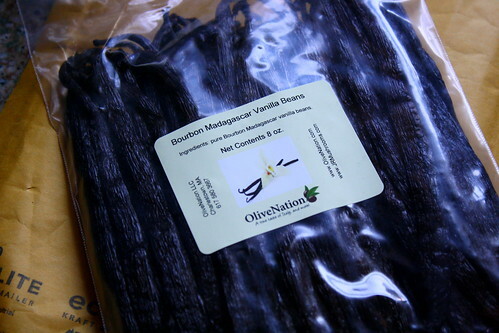 I cannot wait to make my own vanilla extract (although I’ll have to wait 6 months to use it,) vanilla sugar (at least two months before I can use that,) and other vanilla-y concoctions with these perfect, gorgeous beans. Also in the “plus” column, three bags of groceries from Horrock’s for only $50, including a tortilla press and a bag of apples with which to make applesauce. 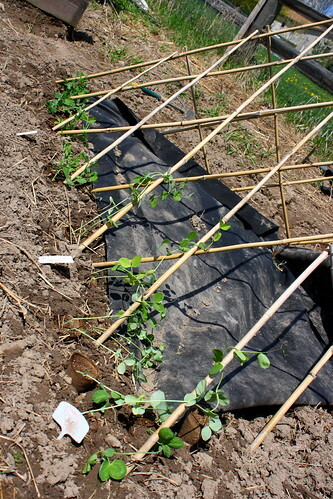 The beans are still inside, out of control and may not survive til the weather warms sufficiently. I hear the chill will be hanging with us for considerable time, possibly until June. This makes me Very Cranky. BUT LET US NOT THINK OF THIS NOW. 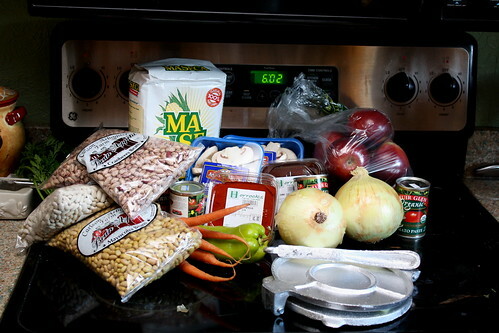 I am going to soak beans. I am going to make these yummy-sounding black bean brownies (not related to the soaking.) I am going to ask The Engineir to grill us up a flank steak tonight to put on our homemade corn tortillas for a street-taco-esque dinner tonight. Tomorrow, we’re going to go to Van Atta’s, and I really hope to find a nice magnolia tree. They’re in bloom right now and they are so, so beautiful. Having one (or three, or five) here would be peachy. So. This is me, enjoying the evening and going downstairs to make the tortillas and to get the applesauce started. Unless there’s a freak accident, we should be done with frost for the season. Which is why I spent the last two days digging out last year’s gravelike mounds and the perennial beds behind them, putting in proper raised bed frames, and planting them. I now have one perennial herb bed, one bed of sugar snap peas, one of compact bush cukes, and one of similarly compact zucchini. South-facing and against the house, so I expect hope they’ll all take off pretty quickly. I want a Magnolia tree so badly-so beautiful!! This girl is jealous!